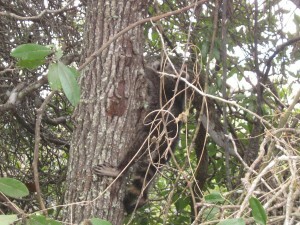 We were called out today to find out what was running around in a customer’s attic. I pulled up to the house and immediately had suspicions of it being an issue with raccoons in the attic as I could see a large hole in the soffit at the roof joint. I went through my usual routine of trying to find out how long the animal has been there, what the customer is hearing, when they hear it, and any other interesting details. People have described what they’re hearing in a lot of colorful ways but this was probably my favorite. I couldn’t help but laugh. She went on to describe how it sounds like a really heavy ball rolling across the ceiling to the other end of a room or the house and slamming into something. Then it would go another way, over and over. It definitely sounded like she had raccoons in her attic. I grabbed my camera, flashlights, and respirator as I prepared to check the attic out for damage and to confirm that it was raccoons she was hearing. Sometimes they’re still in the attic when I go in but unless you corner them or get near their babies, they stay clear. I popped open the attic access and instantly heard something scamper across the attic and out of the hole in the soffit I saw earlier. I walked outside with my camera to try and find the animal and after a couple minutes spotted two juvenile raccoons behind the house fifteen feet or so into the tree line. I walked a little closer to get clear of the brush and limbs to get some pictures. One of them took off deeper into the wooded area. 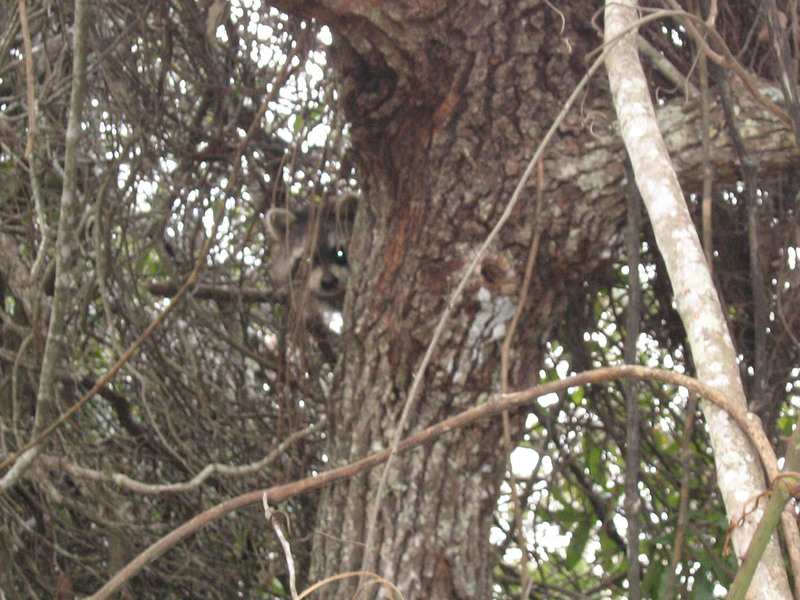 The other stayed put, clung to a tree, as raccoons are great climbers. I snapped a couple pictures and went back to finish the attic and exterior inspection. 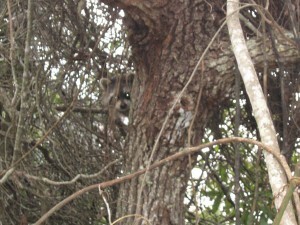 Luckily, the raccoons hadn’t done any damage to the HVAC system or wiring in the attic. You could definitely see where they had been “bowling” though. Insulation was thrown everywhere as they ran back and forth, playing just like dogs do with one another.